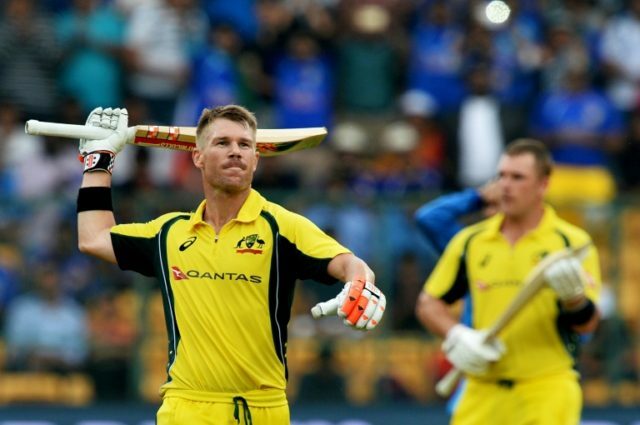 Bangalore (India) (AFP) – Opener David Warner hit a sparkling century in his 100th one-day international to guide Australia to 334-5 against India on Thursday. The swashbuckling opener combined with Aaron Finch to gave the visitors a 231-run first wicket start in the fourth match of the five-game series after they elected to bat. Australia are playing for pride in Bangalore after losing the first three games. The left-right batting pair of Warner, who hit 124 off 119 balls, and Finch, who made 94, pulverised the Indian bowlers attack in the first 35 overs. The left-handed Warner hit 12 fours and four sixes. It was his 14th ODI century since making his debut at Hobart in 2009.